Through seven raw, compelling songs between folk, blues, Americana and free jazz, the 42-year- old speaks to us of farewells and departures, of escape and the sensation of arriving in a new world. In doing so, he crafts a sound which breathes peacefully, pulsating as he surges headlong from intimacy into incredibly dynamic, deep, oppressive darkness. At times it seems as if his music disappears, only to resurface with a flash moments later, shimmering transparently. 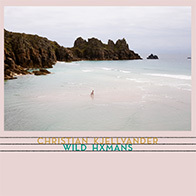 These multifaceted songs are carried by Christian Kjellvander‘s wondrous voice, with echoes of Leonard Cohen, Neil Young and David Sylvian, yet distinctively his own. A voice so brittle in the presence of pain shines even brighter in the coruscating conviction that emotions routinely concealed in everyday life will rise up to the surface.